Surveillance cameras on Granville Street? Late in February, City Council looked at a motion to do with “Upgrading, Reviewing, and Revising the Granville Entertainment District.” It was a lengthy motion and referenced a number of previous work items that Council, and City staff, had tabled. The issue was of interest to us because we see a lot of unrealized potential for Granville. It is one of our city’s most celebrated streets, and yet it seems – despite a costly make-over – in 2008-9 – to miss the mark. It’s definitely not a street that feels welcoming to all residents – or even functionally useful for them. One of the big issues, of course, is the concentration of night-time uses, and the often less-than-savory spill-over effect from the concentration of bars and clubs in the area. But while the Council motion looked strong in a number of ways, it also contained a proposal to install surveillance cameras, as a way of monitoring public activity on the street. Having looked at CCTV in detail over the past few years, this caused us concern. Surveillance cameras, it is often suggested, are a way to reduce criminal activity and wrong-doing. The evidence tends to suggest that this isn’t actually the case. More often, they become a costly intrusion into public life, with little actual return on investment. Even worse, they put everyone in the public – including the vast-majority of law-abiding residents – under unnecessary scrutiny. Like many people in Vancouver, the Vancouver Public Space Network is interested in potential improvements to public space and public life on Granville Street. We support the general spirit of the motion that is being discussed at Council today. THAT Vancouver City Council direct staff to work with the Vancouver Police Department, Bar Watch, and other relevant stakeholders to determine the viability, budget, and timeframe for reactivation of the Street Surveillance Camera Network. As we have noted on a number of occasions with the City (dating back over a decade), the use of CCTV in the fashion suggested by this motion has proven to be costly and ineffectual in many other jurisdictions around the world. On the contrary, evidence shows that in the majority of instances, surveillance cameras do not have a statistical impact on either the overall prevention of crime, or the ability of police to solve a greater number of crimes. Many of the assumed or anecdotal benefits simply do not bear out when subjected to closer study. Most recently, the Acting Privacy Commissioner of BC has also questioned the legality of similar proposals in other municipalities. Alongside this, CCTV cameras do come with a more problematic cost when used in public spaces: they place all users of the street “under the gun” of closed circuit television. This notion of continuous surveillance is an unacceptable intrusion into the public life of the street. 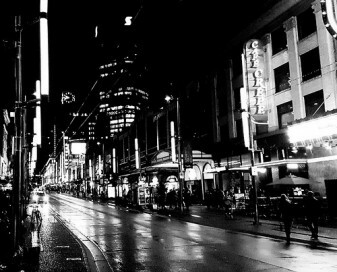 If the City’s goal is to improve public life and safety on Granville Street, there are numerous proactive measures that can be taken. Introducing CCTV along the street is not one of them. We encourage you to strike Part B of the motion, but encourage you to explore other ways to improve Granville Street. Should the City wish to pursue enhancements to the street, we suggest a focus on matters related to street design, transit planning, licensing considerations and more. Indeed, many of these ideas are mentioned elsewhere in the motion. (As an aside, we aren’t totally certain what the motion means by “reactivation” – as the only ongoing electronic surveillance consistently conducted on Granville took place during the Olympics). THAT Vancouver City Council direct staff to work with the Vancouver Police Department, Bar Watch, BC Civil Liberties Association, Pivot Legal Society, Vancouver Public Spaces Network, Downtown Business Improvement Association, BC Law Society, and other relevant stakeholders, including the Granville Entertainment District Safety and Security Working Group (GED SSWG), the Provincial Government, and other B.C. municipalities exploring the use of CCTV, and ask the Provincial Privacy Commissioner to give us an assessment of the use of CCTV in the Granville Entertainment District and to review the efficacy of using Street Surveillance Camera Networks to support safety measures and to deter property damage, theft, violent behavior and consider other methods that could achieve these outcomes minimizing impacts on civil liberties, and report back to Council by June 2018, or sooner if practicable. We look forward to this further discussion, along with other, less intrusive ways to enhance the safety of Granville Street. We’ll provides updates as these discussions take place.